Paperback, all in color on extra strong glossy paper. 84 pages with 25 artistic illustrations. 12 individual stories with attractive horse photos. 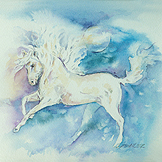 Unique 8.5 in x 8.5 in format. Price Reduced, now just $9.95 plus s/h. The best written and most artistically illustrated children's horse book to come along in a very long time. This delightfully silly book will captivate the imagination of all children and will splendidly entertain and enlighten adults. 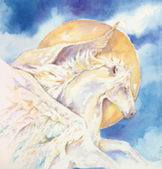 Far, far away, and once long, long ago, a person could look up in the sky and see herds of horses flying. Fantastic but true. Their wings shimmered like mica in sunlight against the sky of sea blue. 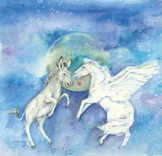 They darted above, under and in-between clouds, kicking up their heels and neighing cheerfully. It was a fantastic sight. Why don’t horses fly anymore? It’s simple. They don’t have wings. Still some horses do forget that they lost their wings and attempt to fly—even today. Did you know that once a long, long time ago, all horses were green—as green as summer toads? Today their different colors like amber and gold enhance their beauty making them more enchanting than ever before. In the following stories, you’ll read about a mother horse and her two young ones, a filly and a colt. Mother shares her fantastic tales, clearly explaining why horses buck, gallop, snort, whinny and eat grass. Of course, she also explains why horses spook, why they have tails, why they have manes, why they have four hooves, why they herd, why they are all different colors, and why they have such long faces. Although, some people already know that horses’ faces must be long enough to reach the bottom of the feed bag. 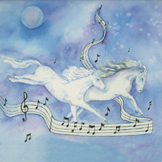 So nestle down and cuddle up--mother horse will entertain you with her favorite fantastic tales of the history of horses. 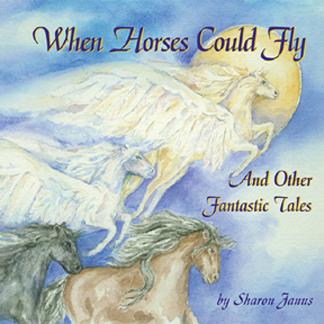 Anonymous once said, “Good children's literature appeals not only to the child in the adult, but to the adult in the child.” The book, When Horses Could Fly and Other Fantastic Tales does just this; it will satisfy the young and old alike. If the author, Sharon Janus’ purpose was to entertain, she has hit her mark. Reader’s don’t necessarily have to be horse crazy to enjoy this book. All children will appreciate the stories, since all they need is the desire to laugh. 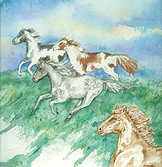 Twelve stories explaining horse behaviors, such as Why Horses Herd and Why Horses Eat Grass, are narrated by a mother horse to her children, two young foals. Since the foals often act naughty, the stories work as a diversion. Imaginatively set in a time when Earth’s creation takes place, the reader will meet not only horses, artistically illustrated by Kathy Newell-Worby, but with creatures like a rusty dragon, rats playing taps and even stranger beings such as hopping butterflies and wild beasty-cats. Some are odder still: “dats and cods and cownowmen.” What are these? You decide: “There were geeps and meeps and dats and cods,” and they were all invited to a dinner party where the reader learns why horses eat grass. It doesn’t matter if some of the creatures are other-than-this-worldly, the context supplies the meaning. Even if it doesn’t, the rhythm and music of the book will likely lull the reader into a state of deep appreciation and sheer enjoyment at the magic of our language, as well as the author’s imagination. All images shown here are from the book "When Horses Could Fly". 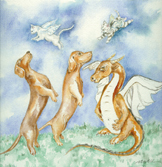 The artist, Kathy Newell-Worby and the publisher Amigo Publications, Inc. reserve all the rights to these pictures.